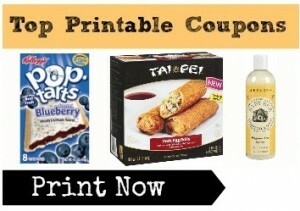 Home > Printable Coupons > Top Printable Coupons | Kellogg’s, Burt’s Bees Coupons & More! Top Printable Coupons | Kellogg’s, Burt’s Bees Coupons & More! Here are all of the top printable coupons from today! I found some real gems under specific zip codes, so be sure and change your zip for easy finding. I am also pumped about the new high value Burt’s Bees coupons!